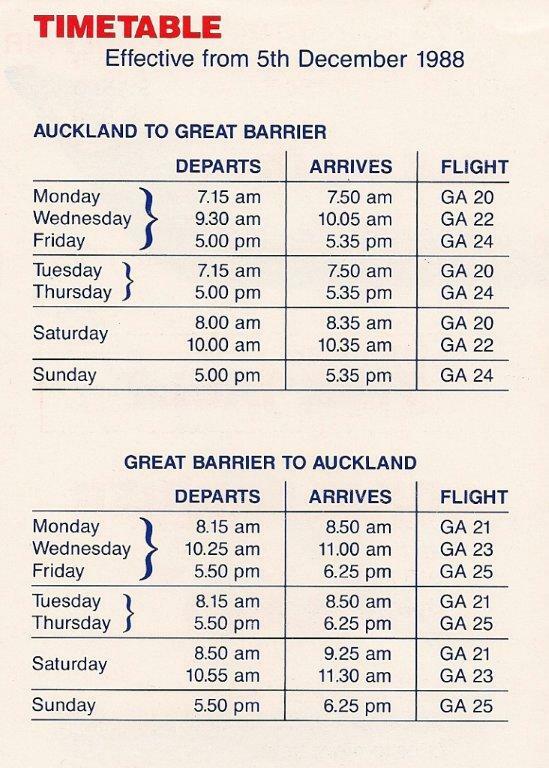 One of the more mysterious operators to Great Barrier Island was Gulf Air. 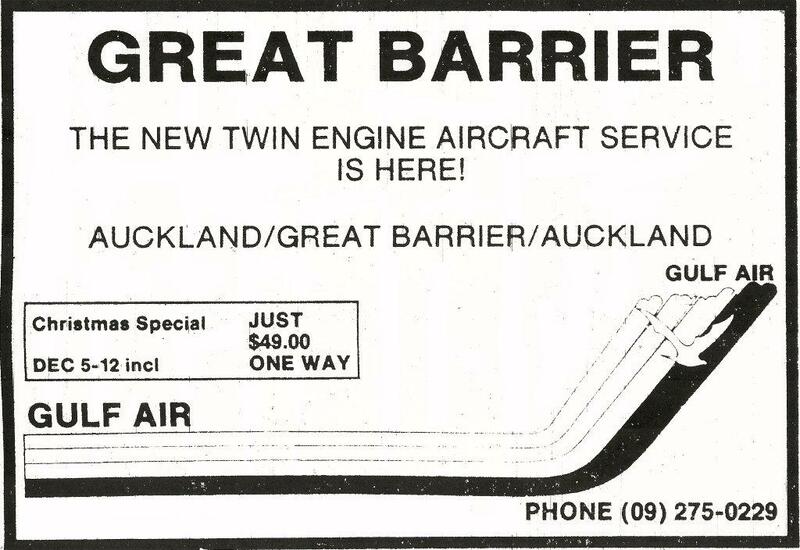 There was no mention of it in the Barrier Bulletin, I could only find one reference to it in NZ Wings and one advertisement for it in the NZ Herald. I have a copy of the timetable and a photo of the aeroplane that a friend took. Most of the information below comes from Bruce Gavin's records. I would love to know more, especially when the service ended. Can you help? 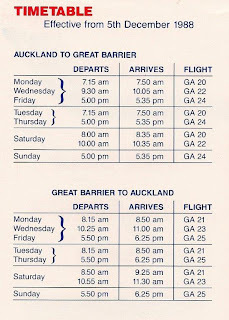 Air Services (Coromandel) Ltd took over the commercial operations of the Mercury Bay Aero Club known as Mercury Airlines on the 1st of November 1986. Operating as Air Coromandel the company initially provided air services between Whitianga, Thames, Pauanui, Coromandel, Ardmore and Auckland. 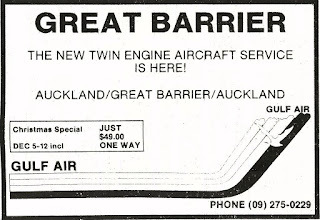 In late 1988 by Air Services (Whitianga) Ltd to break into the Auckland-Great Barrier Island air service market operating under the name of Gulf Air. Operations began on the 5th of December 1988 using a leased 12-seater GAF N22B Nomad, ZK-SNZ (c/n:104). The company’s timetable was very optimistic. Three return flights were offer on a Monday, Wednesday and Friday, two on a Tuesday, Thursday and Saturday and a single flight was offered on Sunday. ﻿﻿There was little coverage of the launch of the new service; there was no mention of it at all in the Barrier Bulletin and a single advertisement appeared in the NZ Herald. The service suffered from intense competition from existing air service operators and from fast ferry operations and was stopped in early 1989 with serious financial losses to Air Services (Whitianga) Ltd.
"Coromandel airline on Barrier run"
Whisper in Timaru - or is it Mount Isa?? ?